Thanks to Buddy-to-Buddy volunteer Paul Jingozian, veterans are being paired with trained service dogs that are helping them improve their quality of life. Paul has a service dog, Sierra, and was previously accompanied for years by the loyal and lovely service dog Aubree. Since the demand for trained service dogs is far greater than the supply, many veterans who would benefit from living with a service dog are on waiting lists that can be years long. “Some of these veterans need a dog right away—these dogs save lives,” Paul says. 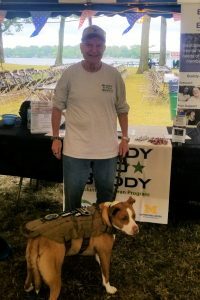 Recognizing that this shortage of service dogs was an issue and knowing firsthand how beneficial service dogs can be, Paul decided to do something to address this problem and started working with friend and fellow veteran Kirk Lanam to start a new organization to train service dogs for veterans. Paul and Kirk formed the Veteran Service Dogs Organization (VSDO) earlier this year, and in that short time, Kirk, an experienced dog trainer, has trained 21 dogs and counting that he and Paul have then paired with appreciative veterans. In recent months, when Buddy-to-Buddy received calls from two veterans needing service dogs, Volunteer Coordinator Jamie Majer knew exactly who to call. Once she let Paul know about those veterans in need, he went to work immediately locating dogs to pair them with. Those two veterans are now living with the dogs and are ready to begin the training that will prepare the dogs to become certified service animals. Paul says, “You watch people meet the dog and they bond right away. Some are really suffering with TBI and PTSD and the dog really settles them down and helps them wake up from nightmares. It helps them get through their suffering.” These are only two out of hundreds of instances of Paul going above and beyond to help service members and veterans in the eight years he’s been a B2B volunteer. Buddy-to-Buddy is proud to have Paul as a volunteer!